The month of April recorded a fall in the additions of mobile connections in India with GSM operators adding only 11.1 million connections compared to 14.49 million in March and February 2011, according to latest data from Cellular Operators' Association India (COAI). The number of GSM mobile users is now at 580.66 million. Idea Cellular added 2.45 million connections and has a base of 91.95 million GSM connections. 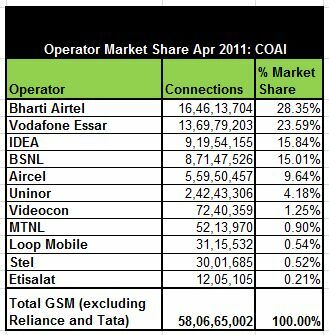 Top mobile operator Bharti Airtel added 2.41 million users and now has 164.61 million connections while Vodafone Essar added 2.4 million connections and has a base of 136.97 million as of April 2011. Aircel has 55.95 million connections, adding 1.1 million users in April. The GSM operations of BSNL and MTNL respectively have 87.14 million and 5.21 million connections. Data from Tata Teleservices and Reliance Communications is not incorporated by COAI.